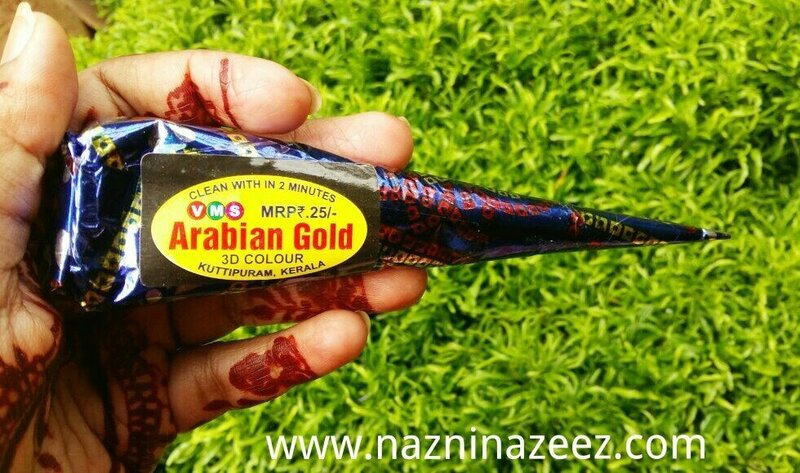 Review : Arabian Gold 3D Henna Cone! Not to mention the extremely colorful packaging! I was quite intrigued. I always sleep overnight with henna on, so that I can get the most intense color. However, this cone was different. I decided to try it out. As I started applying it, I understood how it works. It is jet black in color and very shiny on application. It dries pretty fast (even though not in 2 mins as mentioned on the tube) and it looks exactly like a tattoo. It also changes color to a golden-ish color. It’s very pretty to see. As soon as it is dried, you can peel the design off and the color is absolutely intense!. It’s so surprising. But one thing is sure, this thing contains chemicals. Otherwise it wouldn’t work like this. On top right side, you can see how it looks immediately after application. Then, in the next pic, it has a golden tint. It’s dried & ready for removal. On top left side, you can see that I have peeled back a small part & kept it aside. Here is another surprising thing. It fades fast. The next day itself it faded to the level where normal henna would be on the 5th day or so. The tube is bigger than a regular henna tube (like the green Singh tube which I usually buy). Overall, I would recommend this henna cone, if you need to get amazing results fast for just an occasion or so. Price : Rs 25 (A regular cone costs only Rs 10). I got this from Navaratna Hypermarket, Kerala. Review : Banjara's Hibiscus Hair Care Powder! Review : Brillare Science's Power Repair Haircare range!